So, what do you buy for that dirt-caked, vagabond person on your shopping list who responds “I want to live in a van” when you ask them what they want to do when they grow up? You could waste your money and purchase a gift that encourages them to get a real job and start planning for the future – or you could embrace their dirtbag lifestyle, which is totally what you ought to do. Climbers spend a lot of time exposed to the elements. We all claim to love cold weather for prime sending conditions – but life in freezing temperatures can get pretty miserable. I was gifted a Yellow 108’s Travis Beanie at the beginning of my yearlong climbing trip, and I’ve been wearing it religiously ever since. Made with 30% hemp and 70% recycled organic cotton/hemp, this beanie is as cozy as it is stylish – and when you live in a van, you need all the style points you can muster. Keep your ears warm while covering hair that hasn’t been washed in over a week? Yes, please! Bonus points: The products made by Yellow 108 use either recycled or salvaged. Here’s the thing about dirtbags: We’re really cheap, and usually broke. Spending money on anything is just not on our to-do list, which makes solar power quite enticing – the sun is free! Goal Zero makes a huge selection of products that help you harness the sun’s rays and turn them into energy that can power everything from phones and laptops to blenders and electric razors (both true stories, Niko loves making fruit smoothies in the van, and our buddy Spenser from The RV Project once used our solar battery to power a haircut in Squamish). 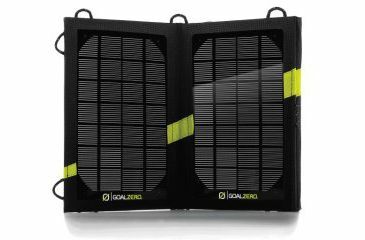 Our entire van is powered by Goal Zero products, and we absolutely adore it all. For a first-time solar user, I would highly recommend the Nomad 7 Solar Panel. Solar power is the gift that keeps on giving! Again, I’ll reiterate something about dirtbags: We don’t always look too good. We’ll wear the same tatter tank tops for years, refuse to buy new gear, and rarely even register how disheveled we often look. 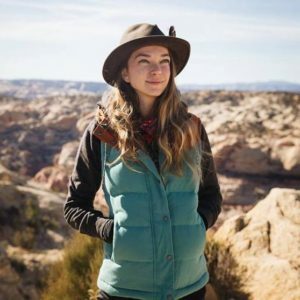 Topo Designs creates the perfect products to sneakily offer climbers a way to combine style with functionality. My favorite pack is the Klettersack, a sleek piece that takes aesthetic cues from vintage design while providing durable portable storage for everything from laptops and electronics to camping supplies and climbing shoes. 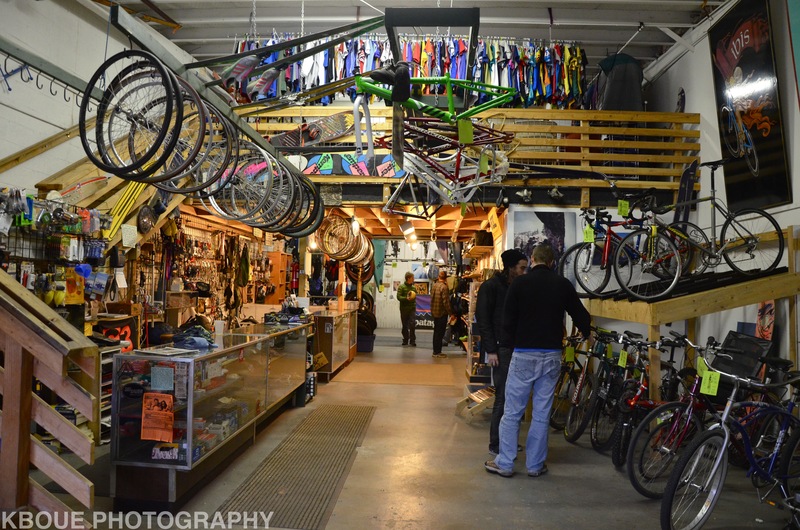 My favorite part about Topo Designs? The products are proudly made in the USA – right in beautiful Colorado – and the folks behind the brand are all wonderful. If you hear a climber mention “prime sending conditions,” it probably means that the temperatures are dipping far below what normal folks would consider pleasant. After jamming frozen toes into down-sized climbing shoes all day, there’s nothing like relaxing and restoring blood flow to your feet with a pair of cozy boots. Surfdome recently sent me a pair of Billabong Brady Slippers, and these comfy slippers make my toes feel like royalty. They admittedly aren’t the most durable pair of fluffy boots, but check out this collection of boots for some snug inspiration from brands like The North Face and Sorel. 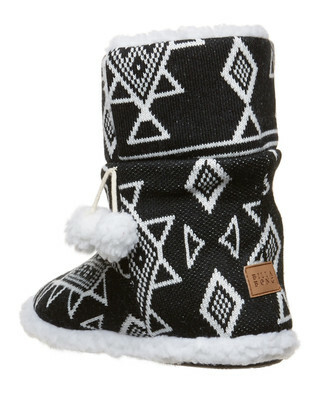 Bonus points if you spoil the dirtbag in your life with one of those pairs of boots that have battery-powered heaters built in! This gift suggestion is something that won’t be accompanied by a specific product endorsement – but the overall message here is this: dirtbags love campfires, and dirtbags really love sipping booze by that fire. The most obvious choice here is whiskey, but a six-pack of quality craft beer is just as enjoyable. Bonus points if you get something brewed or distilled locally! ClimbOn Lip Balm – For the climber that already uses a hand balm, step up their game with a little lovin’ for their lips. PROBAR – Cookie dough flavored nutrition bar that packs 20 grams of protein (and it’s organic and vegan), need I say more? Probar is currently my favorite energizing snack on the trail. Action Wipes – No words needed. Dirtbags are, well, dirty. Help ‘em stay somewhat presentable for those rare occasions when we need to interact with the rest of society. What are you buying for the dirtbag on your shopping list? Dirtbags, what do YOU want for the holidays? If you really want to get to know your climbing shoes, take them on a yearlong climbing trip – at least, that’s what Niko and I did. From splitter cracks in Indian Creek to overhung bouldering at Joe’s Valley, we’ve tested our climbing shoes on gritty sandstone, polished granite, greasy limestone, and everything in between. After wearing through countless pairs of climbing shoes and borrowing shoes from the friends we’ve met at crags along our adventures, we’ve tested and reviewed the best models to help you achieve a send. I’ve always been a believer in the philosophy that shoes don’t make a send, the climber does – but after doing things like trying to send a slab in my super downturned shoes, I’ve changed my tune. 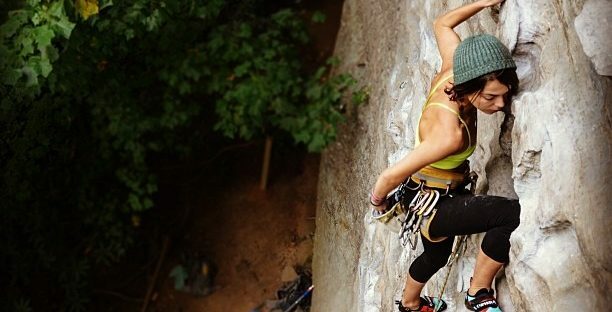 Wearing the right climbing shoe can be essential to a successful climb. 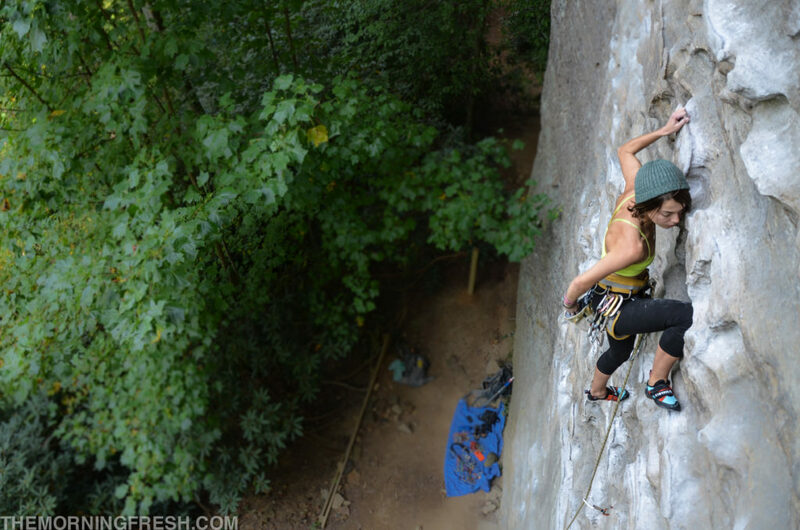 We based these climbing shoe reviews on our personal experiences with each shoe, the overall feedback we received from folks out at crags across the country, and our time spent helping climbers choose shoes while Niko worked at Tallahassee Rock Gym. 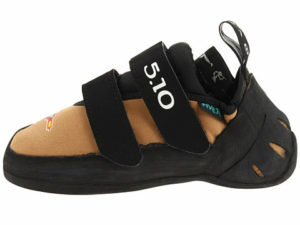 If there is one shoe that I have never heard a single negative remark about, it’s the Five Ten Anasazi. Whether you’re a beginner flailing on V2s or a lifelong crusher battling a V13 project, the Anasazi is a reliable shoe that can accomplish nearly any task thrown its way. This velcro shoe features Stealth Onyx Rubber and stiff sole, making them ideal for fancy footwork on tiny holds. Anasazis are known best for their incredible edging abilities, and superior handling on technical climbs – and they are comfortable to boot. The true test for the Anasazi came for Niko and I during our trip to Squamish. This Canadian wonderland is one of the only world‐class destinations where you can get a taste of bouldering, trad, and sport climbing all in a single day – and no other shoe is as well‐rounded as the Anasazi for tagging along each of these excursions. Heel hooking on an overhung boulder? No problem. Smearing up a slab? Sure thing! Jamming into a crack? Perfect. 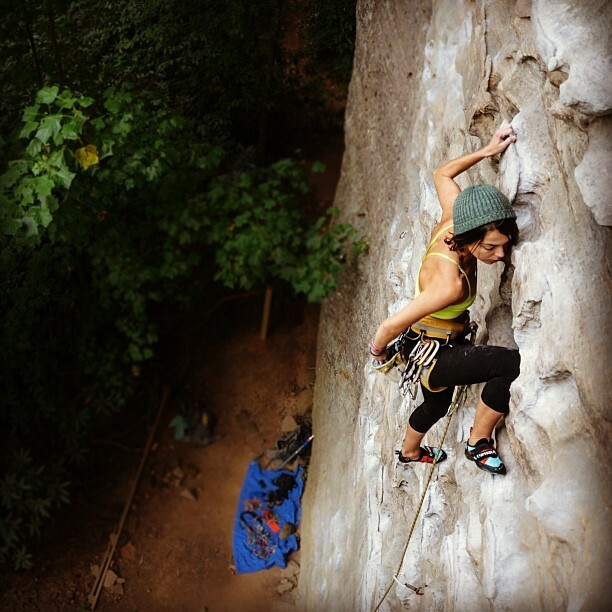 And that is why the Five Ten Anasazi is the best overall shoe for any climbing adventure. Pros: Comfortable, reliable, and functional for any style of climbing. Cons: None. Seriously. I’d love to hear from anyone who has any downsides about these shoes. When deciding on the best shoe for bouldering, Niko and I had a lot of contenders to consider. 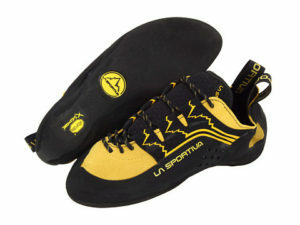 There was the ever‐popular La Sportiva Solution, my beloved Katanas, the Five Ten Dragons, and the Team 5.10s. Admittedly, I still have little girl dreams about my first pair of Dragons, but there is one shoe that has earned the title of the best pick for aggressive climbs: La Sportiva Testarossas. These shoes feature bi‐lateral stretch technology. (Read: it combines non‐stretching Lorica with stretchable leather in a strategic way to help them break in perfectly in all the right places.) It also boasts sticky Vibram rubber, which achieves a balance of gummy comfort and reliable stiffness. Furthermore, these are one of the most durable shoes I’ve owned. I’ve had mine for well over a year, and they are still in great condition. Niko and I both have a pair, and these shoes are usually the first things we reach for during a bouldering session. I bought mine used, so they were already broken in. Niko has purchased two pairs over the past year, and he experiences the same thing that I love about the Testarossas: their unbelievable form‐fitting suction effect. You slide these shoes on, and suddenly, they become your foot – a taloned, rubbery, perfectly downturned extension of your body. Pros: Impressive downturn, form‐fitting, durable. Cons: Expensive. At $175 a pair, these shoes are definitely an investment. Entering the world of crack climbing was a whole new experience that I got thrown into head first when I went to Indian Creek for the first time. The first thing you’ll learn about climbing crack (or any trad, really), is that you are going to need some comfortable shoes. Anything downturned is an automatic no‐go. Our praises for the Moccasyms aren’t just for the popular red slippers that notoriously stain your toes a bloody hue; we also have big love for the Supermocc (which is unfortunately no longer made), and I have two pairs of Mini Mocs, because yes, I totally fit into children’s climbing shoes. What makes the Moccasyms stand out as a superb crack shoe is their comfortable slipper style. Laces or velcro may not seem like a problematic choice for crack shoes, but it won’t take long before the laces are frayed, and velcro straps start getting snagged and undone in jams. Moccasyms don’t fall apart, work with your feet as you contort into tight jams, and provide your toes with comfortable security on the rock. 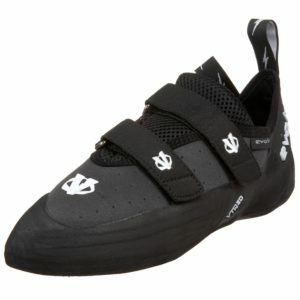 Pros: Comfortable for jamming, Stealth C4 rubber, great smearing. Cons: They turn your feet red, not the best for heel hooking. While climbing is known for its community of broke dirtbags, getting started in this sport can be a pretty expensive investment. 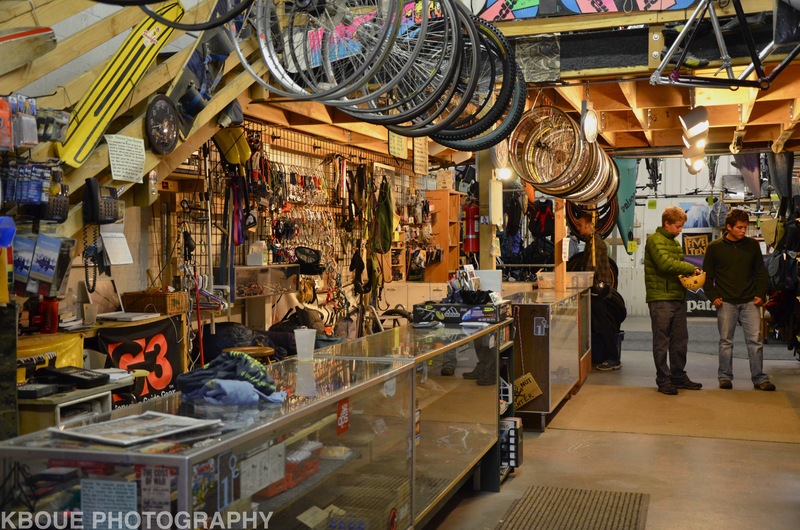 Between a rock gym membership, chalk bag, harness, and new shoes, novice climbers can end up spending a pretty penny. When it comes to choosing your first shoe, some climbers feel pressured to dive straight into the deep end, but we always advise beginners to invest in a pair of Evolv Defys. 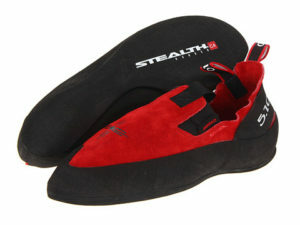 Costing less than $100, these shoes are the perfect choice for someone who wants to get into rock climbing but can’t commit to expensive equipment. My first pair of climbing shoes were Evolvs, and they really took a beating. When you start getting into the lifestyle, it consumes you – I was climbing nearly every single day. While learning new techniques, how to hold your body, and how to use your feet to climb efficiently, you are bound to abuse your climbing shoes. The Defy is a comfortable shoe that helps you get used to the tight‐fitting style of climbing shoes while providing beginners with the perfect stepping stone from rental shoes to style‐specific footwear. We sell more Evolv Defys at Tallahassee Rock Gym than any other shoe. Pros: Affordable, comfortable, and excellent for beginners. Cons: Not particularly appealing for anyone besides new climbers. It didn’t quite make the cut for the best bouldering shoe, but the La Sportiva Katanas deserve a huge shout‐out for being one of the best shoes for women. They were my first pair of “big girl” shoes once I started getting serious about climbing four years ago, and I have loved them ever since. I was inspired to purchase them by an older lady friend who swore by them, and have since convinced numerous women to join the Katana party –and they all love ‘em. The lace‐up Katanas feature Vibram XS grip, lasting downturn, and soft yet firm heel cups. They strike a unique balance between being an aggressive, performance specific shoe and all‐around option. I keep my old pair around as my warm‐up casual shoe, and my new Katanas join me for every bouldering and sport climbing adventure I embark on. I still remember flailing on the heel hook intensive Kill By Numbers (V5) at Joe’s Valley, until I put on my Katanas and got the send! Pros: Great downturn, precise heel hooking, break in very well. 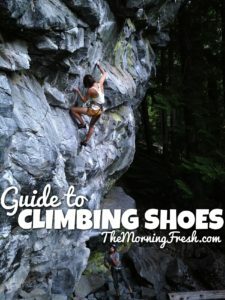 There you have it – a guide to the best climbing shoes for any lifestyle. 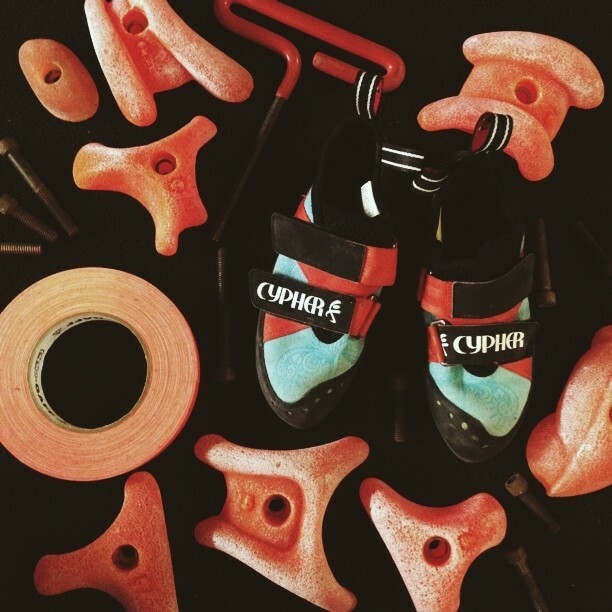 Whether you’re into taping up and jamming your body into cracks, smearing your way up a slab, or pebble pushin’ on a boulder, there’s a climbing shoe designed specifically to help you crush. Climbing on a budget? 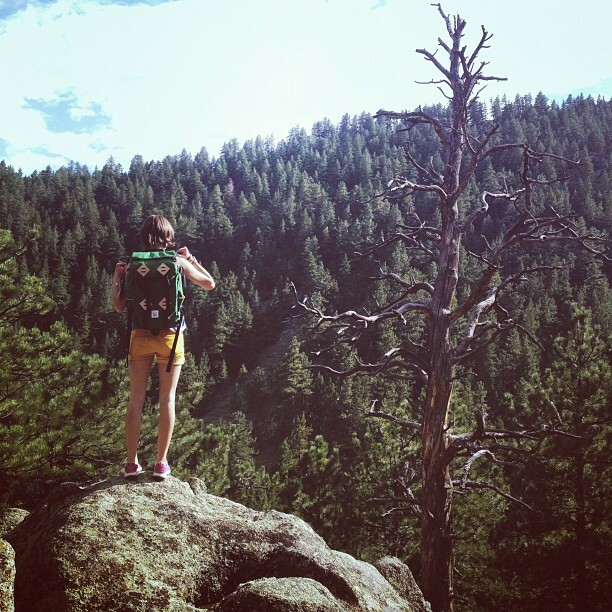 No worries – check The Clymb for deals on climbing shoes (and gear)! We’ve seen huge discounts on brands like Five Ten, Evolv, Scarpa, and more. 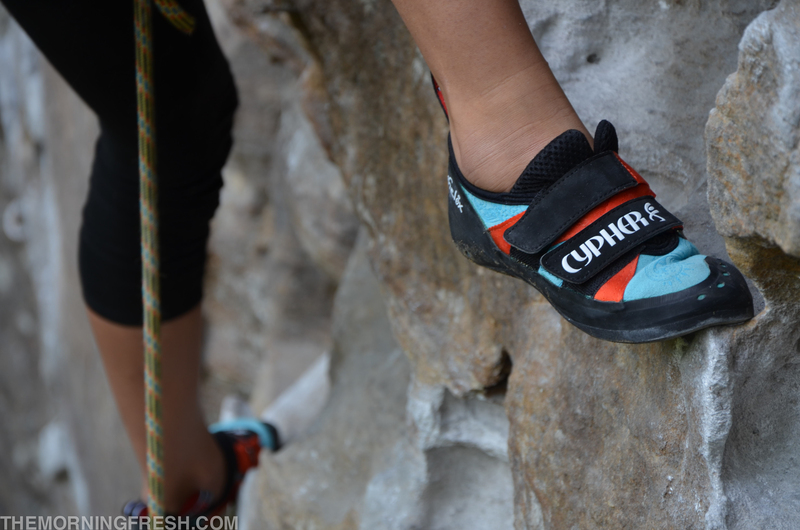 What’s your favorite climbing shoe, and why? 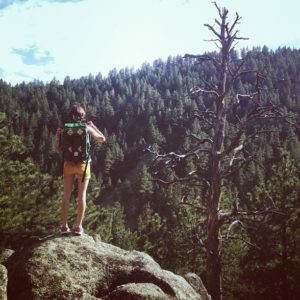 A harness disguised as khaki shorts, and a climbing skort for ladies? I was recently approached by fellow lady adventurer Amy Jurries of The Gearcaster to assist her with a new product review – which led me to a few truly unusual (and maybe awesome) discoveries in innovational climbing gear. 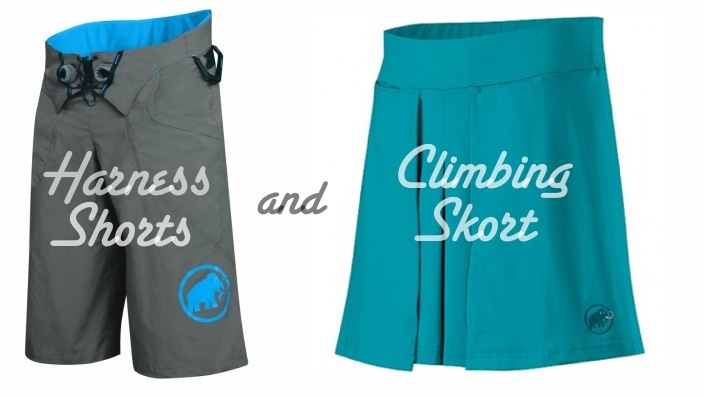 When it comes to the women’s Refine skort, the boys all giggled at the idea of a skirt built for climbing – but you’ll just have to wait for my review to come out on The Gearcaster to find out how it really works out! I’m still pretty wowed by the little velcro straps in the front of the skirt designed to let you pull your harness leg straps up while maintaining the skirt-y shape – pretty darn interesting idea! or the Mammut women’s climbing skort? Would you wear either one of these?